Occupy Together, Occupy Wall St. So, I’ve always had a positive image of hippies. None of the labels about them being unwashed or whatever image problem people could come up with seemed to impact the deeper notion to me–cuz aren’t we all here to gain awareness? From Socrates to Obama to the homeless guy in a wheelchair with no legs and a cup not even that full of coins? So, just like the animals and some children (my own daughter included) could sense the massive earthquake that hit a third of the U.S. anywhere from a day to minutes before most adults had any sign it was coming or even here, I believe we can all sniff fear and freedom on the wind (though of course Bob Dylan said it better–don’t need a weatherman…) So we know what is authentically a freedom movement, and what is not, no matter how any number of paid or unpaid opinions package it. And no matter how it is, or is not, amplified through the media or the blogosphere, the Occupy Wall St rumblings I’ve seen/intuited via the blogosphere, Twitter, and their own website/livestream are tantalizing. The uncertainty is precisely its beauty, giving it large, forgivable proportions that any one of us are free to sculpt. The zeitgeist of economic injustice is so obvious it goes without saying, even if it is being yelled continuously in various marches through the day. And it is a place where all who mourn the injustices of a system that insists on death penalties of all sorts can perhaps find a new way. For the death penalty is not only in the state-sanctioned death chambers of our injustice system, but in our wars, in our tax-payer funded bloodbaths in Iraq, Afghanistan, Pakistan, Yemen, and Libya, and in our info wars where disinformation is scattered with equal ferocity as drone attacks, in our unregulated pollution leading to illnesses that lead to death or debt, in the way we keep ripping people out of their homes and stuffing the pockets of banks ever more while letting them steal with impunity, and deny work to those willing to work because somehow it is cheaper to send jobs to other economies….yes, it is cheaper, because it’s a cheap thing to do, and people have been mad for a long, long time, but they have been long distracted by the three ring hologram of our 2 party delusion…or else long ago retreated from politics, not believing the personal is political every second of every day. Even if you hide it very deep in your heart and never say a word, it will emerge one day. We couldn’t sit on our supposed freedom and not demand something more authentic, after what happened in Tunisia and Egypt….because freedom is contagious. And I believe we will prove it is more contagious than fear or greed. We can smell freedom blowing in the wind…. Date Created/Published: N.Y. ; Washington : Lith. & pub. by H.R. Robinson, 1840. Summary: The artist envisions public repudiation of Democratic hard-money policies, and the triumph of administration opponent Nathaniel P. Tallmadge, a conservative Democrat. 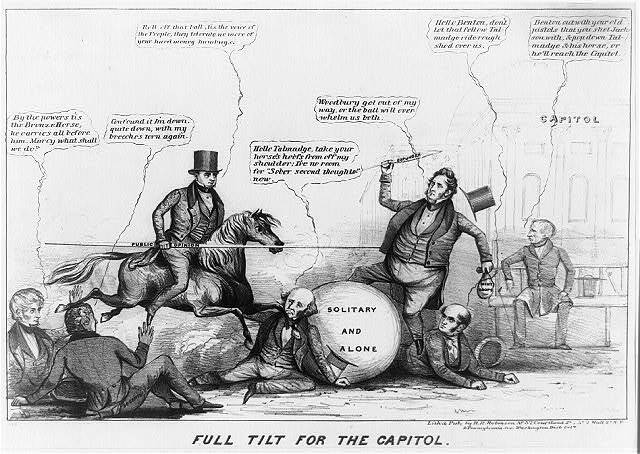 Tallmadge, on horseback and armed with a lance “public opinion,” rides over a fallen Van Buren, saying, “Roll off that ball, tis the voice of the People, they tolerate no more of your hard money humbugs.” Van Buren protests, “. . . take your horse’s hoofs from off my shoulder; I’ve no room for S̀ober second thoughts’ now.” He leans against a large ball marked “Solitary and Alone,” which rolls over Missouri Senator Thomas Hart Benton and Treasury Secretary Levi Woodbury. Benton, who wields a quill “Expunger” and holds “Mint Drops,” exclaims, “Woodbury get out of my way, or the ball will overwhelm us both.” “Mint drops” was a colloquialism for gold coins, and refers to Benton’s advocacy of a higher ratio of gold to silver in circulation. (For an earlier use of the giant ball metaphor see “N. Tom O’ Logical Studies,” no. 1837-14.) Editor Francis Preston Blair (seated on a bench at right) says, “Benton out with your old pistols that you shot Jackson with, & pop down Talmadge & his horse, or he’ll reach the Capitol.” Behind him appear the faint outlines of the Capitol. At left former postmaster general Amos Kendall and former New York governor William L. Marcy sit on the ground. Kendall asks, “By the powers tis the Bronze Horse, he carries all before him. Marcy what shall we do?” Marcy complains, “Confound it I’m down, quite down, with my britches torn again.” Marcy’s trousers are mended with a “50 cents” patch. (On Marcy’s trousers’ patch see &2Executive Mercy/Marcy and the Bambers, &1no. 1838-5.) The print probably appeared during the 1840 presidential campaign, when Tallmadge used his formidable influence in New York State in support of Harrison. It is also possible that it appeared during one of his own bids for reelection in 1838 or 1840. Comparison with other 1840 prints by “HD” supports the later date. Date Created/Published: N.Y. : Pub. by Ths. Kelly, 1871. 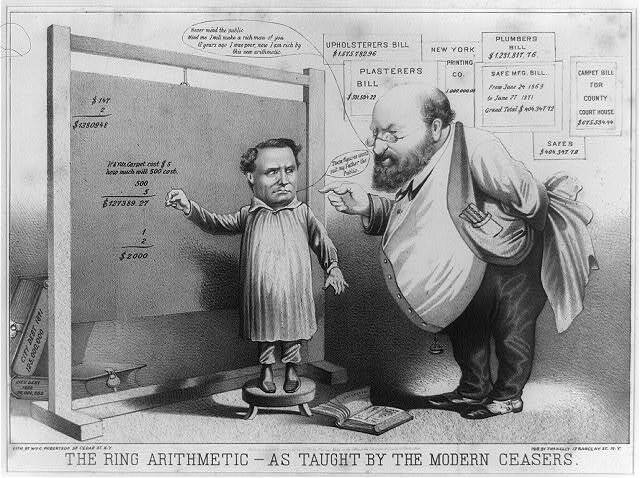 Summary: Tammany political boss William Marcy Tweed is portrayed as a bullying schoolteacher giving New York City comptroller Richard B. Connolly a lesson in arithmetic. A teary-eyed Connolly stands on a stool writing wildly inaccurate equations on a blackboard. For instance, “$147 x 2 equals $1380948”). Connolly protests to his teacher, “These figures wont suit my Father the public,” but Tweed responds, “Never mind the public Mind me I will make a rich man of you 12 years ago I was poor, now I am rich by this new arithmetic.” Behind the board are two padlocked ledgers– “City Debt 1871 125,000,000” and “City Debt 1869 30,000,000.” Exaggerated bills for the building of the county courthouse are posted on the wall. The building’s final cost was $12 million, of which two-thirds was fraudulent. In less than three years Tweed’s “ring” of corrupt officials managed to rob the city’s treasury of $30 million.